Prize: 1 round-trip Economy Class tickets from JFK International, New York to any Asiana Airlines’ destination in Asia ($2,000). 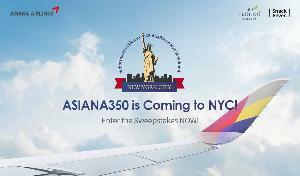 (3) 2nd prizes: ASIANA350 aircraft model at 1:200 scale (Approximate Retail Value: USD 50). Statistics: This contest was opened by 127 and entered by 8 ContestChest.com members. 6% of those who opened the contest, entered it.